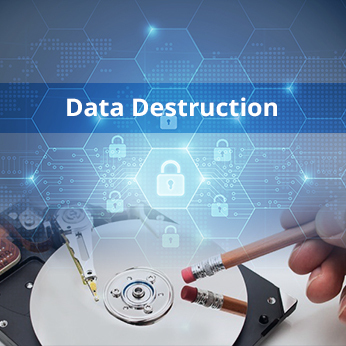 Data destruction is the course of action performed by our specialists to make your data indecipherable from top to bottom by potentially-illicit users. We start the process by wiping out the data stored in your electronic hardware, such as: tapes, and hard drives, etc. We then destroy your useless hardware by severely crushing it, to prevent the mishandling of your sensitive data. We will take it one step further by erasing the data fully so that it would be impossible to decipher. Data is the most crucial part of your business and if it is leaked or accessed by unauthorized persons, it can be used as a weapon against you in this competitive world. It may even cost you big by bringing down your company’s name. Identity theft is one of the fasted growing crimes. Do all that you can to prevent that from happening to you and your loved ones. Before paying big by allowing your sensitive data to be retrieved by the wrong entities, we encourage you to pay a little to stay safe. Your e-waste should go through a proper destruction process. With San Francisco E-waste, you can be sure that your information will be safely and properly disposed of. We know exactly what “end-of-life” means for your data. San Francisco E-Waste follows a course of action for data destruction which ensures the safest demolition. We take special care that the data is not accessible after it has been destroyed. Unlike others we also certify the services which we make available in our Data Destruction Laboratory. We understand the importance of on time delivery and we never let you compromise on that part. What we commit we do it. We make available the whole range of services which will certainly be covered within your financial plan. San Francisco E-waste is a reliable company with years of familiarity and know-how in this field. As an extension of the National Association for Information Destruction (NAID), we meet the terms of the U.S. Department of Defense 522220.22-M. This association holds us to the rigors of confidentiality meaning that your data is secure and has been left in the right hands.